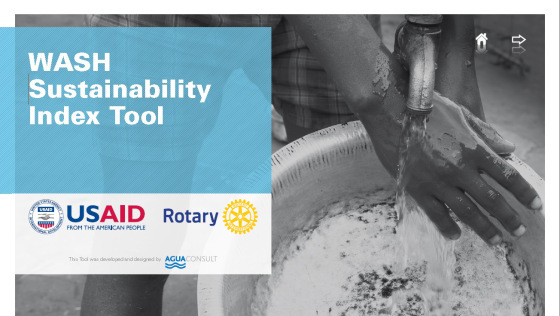 This is just what USAID and Rotary International have developed with the new Sustainability Index Tool, or SIT, which has just been released and is available for download on the WASHPlus website here. The tool was developed by Aguaconsult over a period of more than a year and a half and has been tested in three country programmes, with a further two countries being rolled out in the coming months. The objective of the tool is to enable an assessment of the likely sustainability of WASH interventions using a range of both quantitative and qualitative indicators. It is designed to assess the extent to which crucial sustainability criteria are being met across a range of indicators grouped under five main areas or factors: institutional, management,financial, technical and environmental. The tool is used to analyse specific WASH interventions – for example, a community managed borehole or a school latrine – and provides a set of generic indicators under each of the five factor areas. The tool also expands the level of enquiry beyond only the physical condition of the water supply, sanitation or hygiene infrastructure to include district and national level aspects which can have a bearing on the continuity of services. The indicators in the tool are based on global best practice and the tool pilot testing experiences, but are also meant to be ‘contextualised’ to the country or region in question. The tool provides a step by step process guide for carrying out an assessment, including the modification of indicator questions to fit the reality of which ever country context is being investigated, as well as how to approach sampling of communities and households, preparing field teams and analysing the data. The tool produces sustainability scores for the different factors and can also present the information by type of intervention. So hats off to both USAID and Rotary International for supporting the development of this tool. It will require further support to carry on testing and refining and to scale up use within both of these very different, but complementary organisations. I look forward to the new round of experience and to feedback on the tool itself. This entry was posted in Multimedia, Progress on Sanitation, Sanitary Facilities and tagged Harold Lockwood, irc's approach, monitoring, Rotary International, sustainabilty, United States Agency for International Development. Bookmark the permalink.